We're super excited about the direction our quilt program is taking! 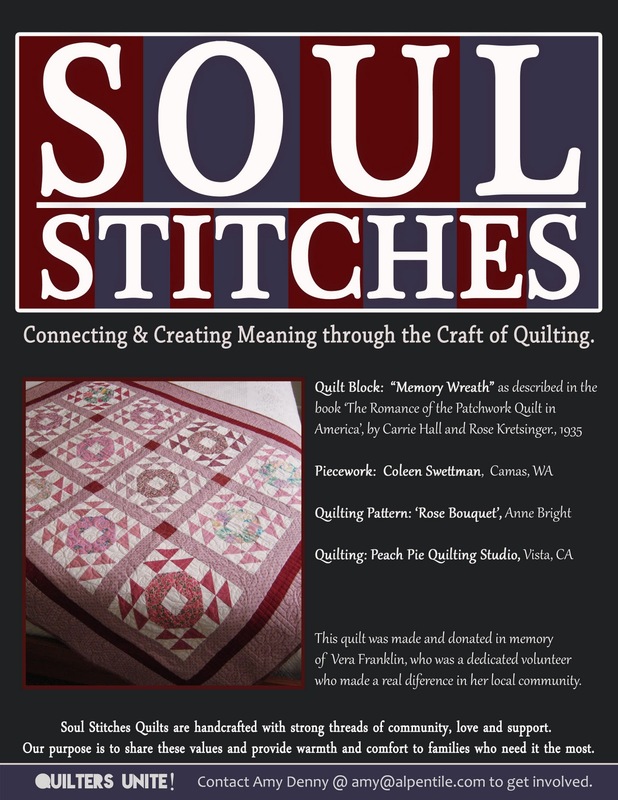 Officially named 'Soul Stitches', the purpose of the program is to deliver handcrafted quilts to families who don't have a blanket - let alone a handmade, original heirloom. This quilt, donated in memory of Vera Franklin, went for auction at today's fundraising event for the Soul Sanctuary in the Desert. The charity luncheon was held at The Sanctuary Resort and Spa in Paradise Valley, AZ. Over 75 attendees were there to support this amazing charity. The quilt was presented during the auction and drew matching bids of $750.00! A total of $1500 was raised because of the generosity of quilters who are committed to giving back. Vera Franklin, (my grandma), was an avid volunteer in her community - spending countless hours at the local library as well as time volunteering in the hospital. She believed in contributing back to her community and I know this donation would make her very happy. We are thankful to Coleen Swettman from Camas, WA, for piecing this quilt together and to Peach Pie Quilting Studio in Vista, CA for an exquisite job of quilting! $750.00 will go to the Soul Sanctuary, and $750 will go towards quilting supplies so that these pieces can keep coming! 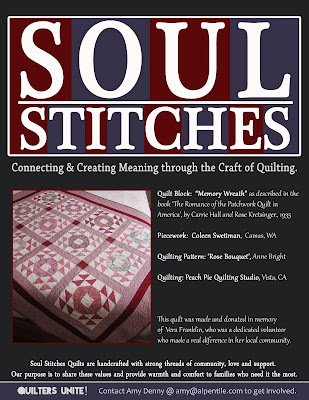 Soul Stitches needs donations to purchase 2 sewing machines, assorted fabric and thread for Phase 2 of the program: To teach quilting classes at the shelter, and involving the families in the donation process. We already have volunteers who will come out to teach the classes, but need the tools and supplies. The Soul Sanctuary is a women's shelter in Phoenix, AZ that has been in operation for 8 years and during that time has rehabilitated over 60 women, and 200 children. All of this is accomplished with an annual budget of $30,000, and help from the volunteers that rally around this successful cause. The women who go through the program obtain degrees and get jobs, learn parenting skills, learn about nutrition and healthy living, receive psychological and emotional support, and are taught to give back to their community. Many continue to be involved in the shelter even after graduation from the program. It is an inspiration to meet these women who have chosen a better life for themselves and their families.